Enjoy the Holiday lights with a chauffeur driven tour. We provide holiday music or you’re welcome to bring your own mix. The chauffeurs will show you the finest lights available in the Eastern Metro, or if you have an area you are particularly fond of, let them know. Tours start the second week of December with a two hour minimum Sunday through Thursday, three hours on Friday and four hours on Saturday. Celebrate New Year’s Eve with one of our chauffeurs in Total Luxury. Not to worry about parking, traffic and the ever popular blue and red lights in your rear view mirror. Good times Take time and we prefer you get home safely. “No we won’t tuck you in.” We require a 6 hour minimum so plan accordingly. Vino in the Valley- A unique, outdoor dining experience designed to stimulate all your senses. 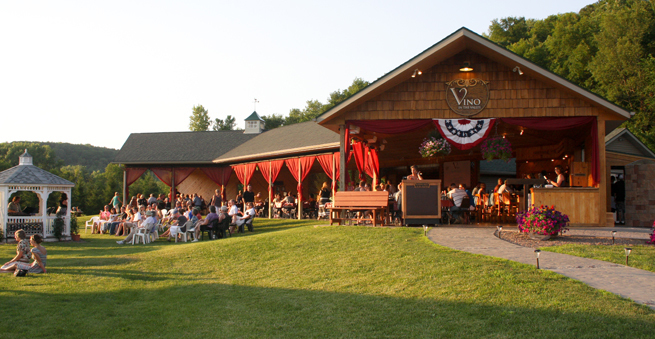 Every Thursday, Friday and Saturday night, as well as Sunday afternoons, May through September (with additional weekends October through December), enjoy a glass of wine and a pasta dinner among the vines in an outdoor setting nestled in the heart of the Rush River Valley. You'll take in the sites of the emerging vineyard while dining on Italian nachos, gourmet pizzas, pasta and sipping area made wine, in addition to wines from all over the world.